NASA Future In-Space Operations: International Human Lunar Surface Scenario. Now available is the September 20, 2017 NASA Future In-Space Operations (FISO) telecon material. 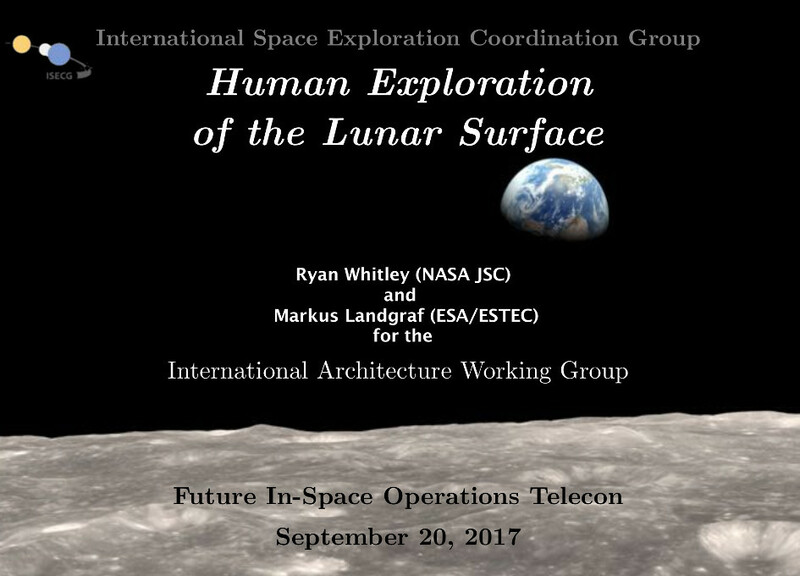 The speakers were Ryan Whitley (NASA HQ) and Markus Landgraf (ESA ESTEC) who presented "International Human Lunar Surface Scenario." 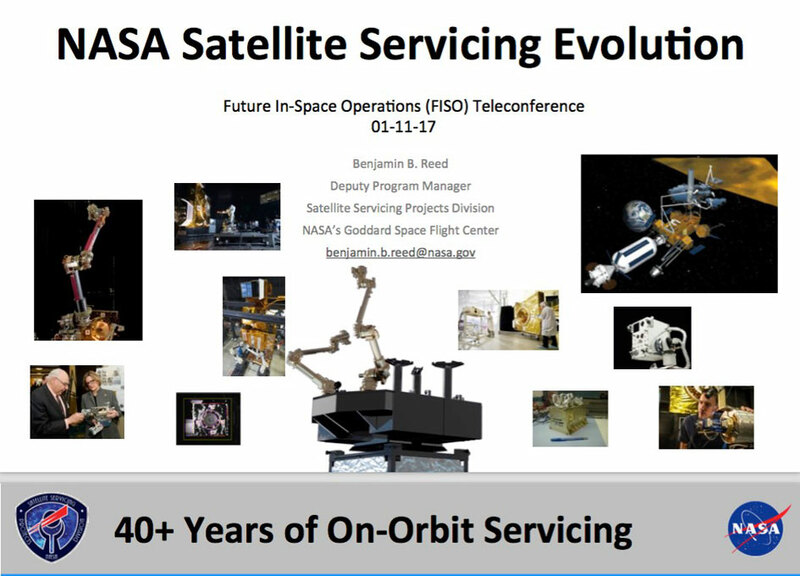 NASA Future In-Space Operations: NASA Satellite Servicing Evolution. Now available is the December 21, 2016 NASA Future In-Space Operations (FISO) telecon material. The speaker was Steve Collicott (Purdue University) who presented "Research and Education Missions on the New Commercial Sub-orbital Rockets." Now available is the November 16, 2016 NASA Future In-Space Operations (FISO) telecon material. The speaker was Madhu Thangavelu (USC) who presented "MOBIUS - Supersynchronous Earth Orbits for Lunar Missions." Now available is the November 2, 2016 NASA Future In-Space Operations (FISO) telecon material. The speaker was Brian Weeden (Secure World Foundation) who presented "A Primer on Public Policy, Why it's Important for Space Activities, and Current Hot Policy Topics." Now available is the October 19, 2016 NASA Future In-Space Operations (FISO) telecon material. The speakers was Steve Robinson (UC Santa Cruz) who discussed "An ISS Space Ambulance Based on X-37B Technology." Now available is the September 21, 2016 NASA Future In-Space Operations (FISO) telecon material. The speakers was Philip McAlister (NASA HQ) who discussed "NASA Collaboration with SpaceX's Red Dragon Mission". Now available is the September 7, 2016 NASA Future In-Space Operations (FISO) telecon material. The speakers were Mark Lupisella, Jack Bleacher and Michael Wright of NASA GSFC who discussed "Low-Latency Teleoperations for the Evolvable Mars Campaign". Now available is the August 31, 2016 NASA Future In-Space Operations (FISO) telecon material. The speaker was Jim Bell (ASU) who discussed "Telerobotics from Mars Orbit - Lessons from Robotic Exploration for Human Missions to Mars"
NASA FISO Presentation: NASA Space Portal - A Framework for Space Exploration and Development in the 21st Century? Now available is the August 17, 2016 NASA Future In-Space Operations (FISO) telecon material. The speaker was Dan Rasky (NASA ARC) who discussed "NASA Space Portal - A Framework for Space Exploration and Development in the 21st Century?" Now available is the August 10, 2016 NASA Future In-Space Operations (FISO) telecon material. The speaker was Leslie Deutsch (NASA JPL) who discussed "The Deep Space Network - The Next 50 Years." Now available is the July 6, 2016 NASA Future In-Space Operations (FISO) telecon material. The speaker was Tibor Balint (Royal College of Art -- Innovative Design Engineering/JPL) who discussed "Design Space for Space Design: Cybernetics, Human-Centered Design, and NASA." Now available is the August 3, 2016 NASA Future In-Space Operations (FISO) telecon material. The speakers were Chris Sanders (AeroJet Rocketdyne), Mike Fuller (Orbital ATK), and Bob DaLee (Boeing), who discussed "NASA's Space Launch System: Powering the Journey to Mars." Now available is the July 27, 2016 NASA Future In-Space Operations (FISO) telecon material. The speaker was Steve Jolly (Lockheed Martin) and Steve Bailey (Deep Space Systems) who discussed "Mars Science Enabled by the Mars Base Camp 2028 Proposed Architecture". Now available is the July 20, 2016 NASA Future In-Space Operations (FISO) telecon material. The speaker was Tony Cofer (Purdue) who discussed "The Film Evaporation MEMS Tunable Water Microthruster Array". Now available is the July 13, 2016 NASA Future In-Space Operations (FISO) telecon material. The speaker was Francis Cucinotta (UNLV) who discussed "New Estimates of Space Radiation Risks are Favorable for Human Exploration of Mars". Now available is the June 29, 2016 NASA Future In-Space Operations (FISO) telecon material. The speakers were Erich Bandeau and Ian Clark of NASA's Jet Propulsion Laboratory (JPL) who discussed "Large Supersonic Ballutes: Testing and Applications". Now available is the June 22, 2016 NASA Future In-Space Operations (FISO) telecon material. The speaker was Gary Barnhard of Xtraordinary Innovative Space Partnerships, Inc. (XISP-Inc) who discussed "Near Real-Time State Models - a Foundational Technology for Space Automation and Robotics". Now available is the June 15, 2016 NASA Future In-Space Operations (FISO) telecon material. The speaker was Gordon Roesler of DARPA's Tactical Technology Office who discussed "Robotic Servicing of Geosynchronous Satellites". Now available is the June 8, 2016 NASA Future In-Space Operations (FISO) telecon material. The speaker was Lawrence Kuznetz of Space Spinoffs, Inc. who discussed "Future Spacesuits, the Moon vs Mars, and Engaging STEM Talent". Now available is the June 1, 2016 NASA Future In-Space Operations (FISO) telecon material. The speaker was Koki Ho an assistant professor at the Department of Aerospace Engineering of University of Illinois at Urbana-Champaign (UIUC) who discussed "Campaign-Level Dynamic Network Modelling for Spaceflight Logistics for the Flexible Path Concept". Now available is the May 25, 2016 NASA Future In-Space Operations (FISO) telecon material. The speaker was Markus Landgraf (ESA/ESTEC) who discussed "HERACLES: Preparing Human Exploration by Integrated Certification of Crew and Hardware for Lunar Surface Operations". Now available is the July 29, 2015 NASA Future In-Space Operations (FISO) telecon material. The speaker was Brand Griffin (NASA MSFC) who discussed "Evolvable Mars Campaign Small Habitat Commonality Reduces Cost and Improves Operations". Now available is the October 21, 2015 NASA Future In-Space Operations (FISO) telecon material. The speakers were Frank Eichstadt (MS Space Architecture) and Dan Jones (Geentech Motors) who discussed "High-Efficiency Electric Motors/Generators for Exploration". Now available is the July 8 , 2015 NASA Future In-Space Operations (FISO) telecon material. The speaker was Michael Gernhardt (NASA JSC) who discussed "Human Exploration of Phobos". Now available is the October 28, 2015 NASA Future In-Space Operations (FISO) telecon material. The speaker was Jonathan Gardner (NASA GSFC) who discussed "The James Webb Space Telescope". Now available is the October 21, 2015 NASA Future In-Space Operations (FISO) telecon material. The speaker was Micheal Roberts (CASIS) who discussed "CASIS - Enabling Research on the ISS National Lab for the Benefit of Earth". Now available is the July 1, 2015 NASA Future In-Space Operations (FISO) telecon material. The speaker was Mike Gold (Bigelow Aerospace) who discussed "Bigelow Aerospace's Past Accomplishments, Present Activities, and Future Plans". Now available is the June 24, 2015 NASA Future In-Space Operations (FISO) telecon material. The speakers were Peter Jenniskens (SETI Institute) and Bruce Damer (DigitalSpace) who discussed "SHEPHERD - A Concept for Gentle Asteroid Retrieval with a Gas-Filled Enclosure". Now available is the June 17, 2015 NASA Future In-Space Operations (FISO) telecon material. The speakers were Uwe Derz (Airbus Defence and Space) and Juergen Hill (DLR) who discussed "The German Free Flyer Study: A European Perspective on an International Infrastructure in the Earth-­‐Moon Libration Point 2". Now available is the June 10, 2015 NASA Future In-Space Operations (FISO) telecon material. The speaker was Doug Craig (NASA HQ HEOMD) who discussed "An Overview of NASA's Evolvable Mars Campaign". More top stories from April.